Streaming services like Netflix and Amazon Prime Instant Video have enjoyed a meteoric rise over the last few years, with the streaming industry now forcing more established media distributors and content creators to pay attention. In a recent Theme report by the Motion Picture Association of America for 2018, the size of the streaming industry is shown to be too big for studios to ignore. In the section titled "Global Pay TV and Online Video, the MPAA reveals the number of subscriptions to video streaming services grew 27 percent year-on-year, rising to 613.3 million, based on data from IHS Markit. The increase makes 2018 the first year on record where online streaming video service subscriptions were higher than those for cable subscriptions, which dropped 2 percent to 556 million. Internet Protocol TV (IPTV) just overtook satellite in the year, with both between 200 million and 300 million subscriptions. According to the MPAA, households could be counted multiple times within the results, as in a family could have both a cable subscription and one to a streaming service. The results do not advise on households that subscribe to just one service, nor how many subscriptions were made per household. Despite the higher numbers, cable continues to have a disproportionately high amount of subscription revenue. Cable revenue went up $6.2 billion to $118 billion for 2018, with satellite close behind with almost $100 billion, but online subscription video is still at around $40 billion in revenue by comparison, despite the growth. The report also highlights the TV and movie industry is continuing to grow overall, with a 9-percent year-on-year increase for combined theatrical and home entertainment revenue of $96.8 billion, up 25 percent from five years ago. Global home entertainment spending grew 16 percent to $55.7 billion, with US spending up 12 percent. The report arrives ahead of Apple's "It's show time" March 25 event, widely expected to involve the launch of an on-demand video service. The March 25 event will reportedly be a star-studded affair, with appearances by people such as J.J. Abrams, Jennifer Garner, and Steve Carrell to commemorate the unveiling of Apple's original video content project, which has seen the investment of at least $1 billion so far into TV shows and movie productions. 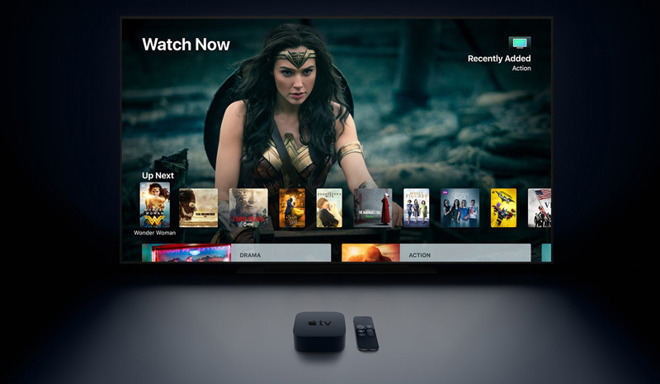 As well as the video service, Apple is also expected to launch Apple News magazines, a paid subscription that allows users to read digital magazines from their Mac or iPad. Little birds are telling me Apple may join Disney. ... though the lion's share of revenue still goes to the cable companies. “Join”? Bob Iger is on Disney’s BoD, Steve Jobs’ widow is one of the larger holders of Disney stock due to the sale of Jobs’ Pixar to Disney... I mean, they’re joined at the hip already. Rest of cable subscribers are in rural area where no high speed internet available. Since these results don't take into count the households that have both cable/satellite AND a streaming service or two, the reality isn't what the article makes it out to be. I believe the majority of cable/satellite households also have Netflix, etc., but their primary watching is done via cable/satellite. If the point of the article is to say more people stream than use cable, then it's not really so. What is AT&T doing with the free WatchTV application that comes with your cellular plan, which has 30 free channels and 1 free choice of HBO, Showtime, or STARS? They own Direct TV and have TV Now application for streaming. Seems like it competes with itself on a water down level, no? Since subscribers for cable are trending down and cable revenues are trending up, I am pretty sure the cable companies don't care. I was surprised last week, when it came time to sign up for a new promotional rate for Internet from Comcast, that they actually lowered my monthly rate by15%. Something must be happening or working. Maybe they understand it will be easier for someone to come in and take the internet business than it is to take the television business. 5G has promise lets see how they manage that. though the lion's share of revenue still goes to the cable companies. Despite the higher numbers, cable continues to have a disproportionately high amount of subscription revenue. For one thing, Cable has either a virtual or an actual monopoly on broadband in the majority of US markets, so even if you want to cut the cord, you're still tethered to your cable company for internet service. The fact that cable companies continue to over charge helps too. Of course, that's also what's driving everyone away from them. It's a bit of sweet justice - the cable companies have had crap customer service and been over charging customers for years and now that there's a viable alternative, people are fleeing in droves. The bad part about all this from the consumer's standpoint is that the market is becoming much more fragmented. Each of the various options has something that people want but there's no single place to get it all so you end up with separate Netflix, HBO, Hulu and ESPN subscriptions and end up paying as much as you would have with Comcast. Of course, I'd rather give my money to anyone but comcast, so I guess it's still a win. Netflix has set the bar pretty high with their service and high quality original content - at a very tolerable all-in price. Like many AI readers, I'm a gadget junkie at heart and I'm struggling to get excited about this event, much less just about anything that adds yet another subscription to my monthly budget. It's death by a thousand cuts. Yeah, it makes sense for Apple's bottom line, but I'm just not feeling it. Expectations are very low. Let's see what Apple can do to flip the script. Hey, maybe Apple will announce a new larger screen iPod Touch ... something, anything, a tiny bit of antidote to help offset the effects of yet another subscription affliction. I agree completely. I'm not bothering to watch today's event. Reports on the web will be enough as I don't expect much that I';m interested in. And yes a pox on these dozens of subscriptions. they're like a cloud of mosquitoes, and about as entertaining. Really?! Are there rural areas with cable yet no high-speed internet? I wouldn't think so. Now, if you said rural without a cable provider, having no high-speed internet would make sense. Although the cable industry has gone through lots of consolidation in the past two decades, there focus has been in more populated areas. As such, there are still smaller cable companies in certain areas. These smaller companies tend not to lay fiber for high-speed internet. Even the big providers have an economic incentive to prioritize investments in denser areas over rural areas. I've half-jokingly said Apple should buy Disney several times, now with all that content is seems an even better idea. Apple wouldn't have to run theme parks etc., they could either spin all that stuff off, or set up as a stand-alone company. Igor is on Apple's board already. Imagine the beautiful Apple Stores Apple could build in Disney and all the ways Apple can use Disney for promotion. Most rural areas can't even get cable. Only option is satellite. If you can get cable, you can get high speed internet. Most rural areas you can't even get DSL. I live outside the city limits and my only option for TV is antenna or satellite. The only option I have for internet is some local companies fixed broadband wireless. I don't think the report is saying what some are thinking it does. A whole lotta "streaming subscribers" are actually cable subscribers who happen to sign up for Netflix too. Every other streaming service is far behind them. The article isn't identifying the numbers for those who use cable/satellite distinct from those who only use streaming services. Reading it rather than skimming makes that clear. Cable is defined by greed. If they did right for their customers they’d dominate for the next 20 years. They’ve already spent to get cable run to the majority of homes. Their costs are low. Instead of being competitive they bleed the rock (customers) because they could. Now, customers with options are giving them the finger. When I watch cable (or satellite) at a friends, their is so many commercials TV was unwatchable. You pay for the service then the greedy @#$& waste your time with more and more commercials? It might make Cable more profitable, but very few are going to stick with them when other options are available. I’m unlikely to sign up for Apple’s streaming service, because I abandoned TV 5 years ago, but I wish them luck. Streaming TV depends on Cable TV's broadband. Cable TV already jacked up my internet service charge due to frequent usage of streaming. It's a Win-Win situation for Cable TV. I might be too old for this. My priorities are the traditional ABC, CBS, NBC fans PBS. The commercial Big 3 are delivering local news plus all 3 have sophisticated Weather Radars (we live in Tornado Ally) which is important for severe weather, PBS comes in with some great series (Victoria is our must see) and and options in the future must address those needs. For me the availability of MSNBC and CNN is also critical. FOX I can do without, but some people will have it on their. must see list. The importance of access to local TV is going to be critical for many traditional customers and that is a large market. That his why I'm looking at what Apple is offering today. I'll be happy to acquitter their offering as long as my basics are included - and I believe that a lot of people are like me.